Our Speedy Cheats Pizza is the perfect snack or meal to quickly throw together in under 5 mins for any hungry child or adult. This is one of our favorite recipes to get the kids involved too and they have so much fun picking out the toppings they want that they gobble it down. TURN on the grill to 180°C/gas 4. SLICE the bagels in half, horizontally. PLACE them on a baking tray, cut side up, and place under the grill for 5 minutes. BLEND the tomatoes with the oregano and a splash of olive oil. 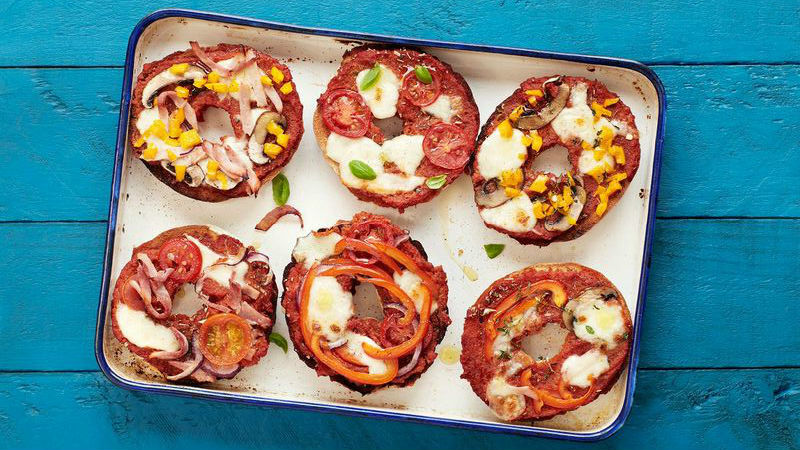 SPREAD a thin layer of tomato sauce over the toasted bagels. TOP with cheese and your desired toppings. GRILL for 2–3 minutes, or until the cheese is golden brown. SPRINKLE the top with a little salt (for toddlers and adults).